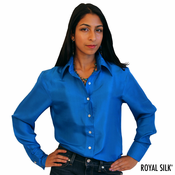 Smart, sophisticated button-down women’s silk shirts by Royal Silk® are affordably priced to introduce you to the striking beauty of silk. 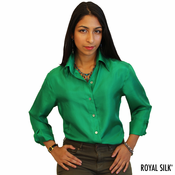 A pure silk shirt in a scintillating color is a true fashion essential for every savvy, worldly woman. 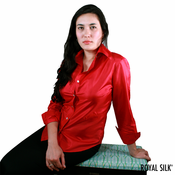 This elegant silk shirt also makes the grade for a highly-coveted under $50 gift that will be much appreciated and remembered for a very, very long time. Sizes XS to 2XL. Priced from $49 - $65. Your satisfaction is guaranteed. 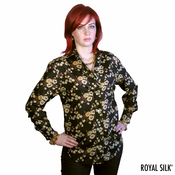 You will twinkle, dazzle, and shine in this classy button-down silk shirt by Royal Silk®. This chic, sophisticated classic will go the distance. It's so versatile that you'll wear it forever and in every which way. 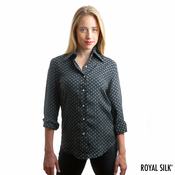 Tuck it in or tuck it out with sleeves down, buttoned or unbuttoned or with cuffs rolled-up at different lengths. You will wear it with skirts, pants, jeans, or shorts. Or you can layer it over a good-looking tee, tank, or top. Once you own one, feel the silk, and try it on against the skin, you’ll want in different colors. 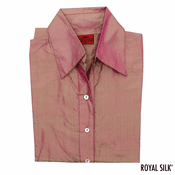 This is a well-constructed silk shirt with French seams, high-quality mother-of-pearl buttons, and features a large, cosmopolitan collar. It’s full cut, and generously sized, as seen in the pictures. 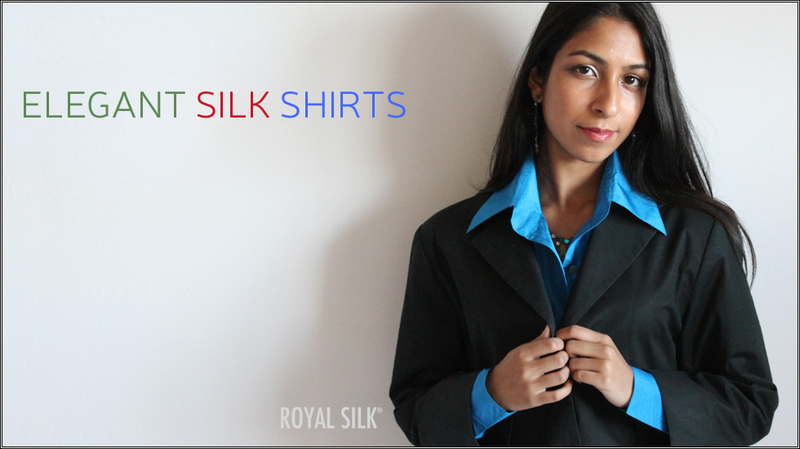 Styled in 100% India Silk that is light, soft, washable, and easy to care for. This is the silk that has been around long before there were dry cleaners, so it can be either hand-washed or dry-cleaned. Each shirt comes with easy care instructions. Or you can machine wash with use of our exclusive washer bag for silks that is made in the USA. The shirt is imported. Sizes XS to 2XL. For questions about sizing, please refer to the size chart. $49. 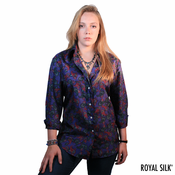 If you favor prints, the iconic Royal Silk shirt also comes in enticing patterns shown below. 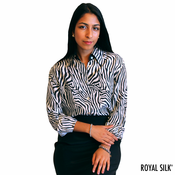 Note that the elite Zebra Print features additional details, such as: a contrast black silk banding on the cuffs, collar, and the button placket; also, the Zebra Print is styled with a somewhat smaller collar than the other patterns. All are made in lightweight India Silk. Hand wash or dry clean. Or you can machine wash with use of our exclusive washer bag for silks that is made in the USA. The silk shirt is imported. Sizes XS to 2XL. For size questions, please refer to the size chart.